Relatively few people across the globe have confidence in U.S. President Donald Trump to do the right thing when it comes to world affairs. And some of his most prominent policy proposals – such as building a wall between the U.S. and Mexico, withdrawing from trade and climate agreements, and restricting people from some Muslim-majority countries from entering the U.S. – are deeply unpopular. Opposition to the United States’ possible withdrawal from the Iran nuclear agreement is less intense worldwide, and such a move would be welcomed by a majority of the public in Jordan and Israel. Around the globe, confidence in the U.S. president is at some of the lowest levels measured by Pew Research Center over the past decade and a half. Looking back to earlier in the century, President George W. Bush’s ratings fell in the aftermath of the Iraq invasion in 2003 and never fully recovered in some countries. Across 26 countries the Center surveyed near the end of his term, from 2007 to 2008, a median of only 27% had confidence in Bush’s ability to handle international affairs. This included 2% in Turkey, 7% in Jordan and Argentina and 8% in Spain. However, he did retain relatively strong support in sub-Saharan Africa, including 72% confidence in Kenya and 69% in Ghana as of 2007. In 2009, with the election of Barack Obama, ratings for the U.S. president soared in many countries, especially in Europe and Asia. And despite a dip in confidence in some nations coinciding with increased use of drone strikes and the 2013 spying scandal with the U.S. National Security Agency, by 2015 and 2016 Obama had retained or improved upon most of his global support. Across the 37 countries surveyed in that time period, he enjoyed a median confidence rating of 64%. This included support from roughly nine-in-ten or more in the Philippines (94%), Sweden (93%), the Netherlands (92%) and South Korea (88%). However, despite concerted efforts to improve America’s image in the Middle East, only 14% in Jordan, 27% in Tunisia and 36% in Lebanon expressed a positive view of his leadership. Additionally, only 11% in Russia had confidence in Obama by 2015. With the election of Donald Trump, confidence in the U.S. president’s ability to do the right thing regarding world affairs has plummeted in many of the countries surveyed, often back to levels that are similar to or lower than what Bush received in many countries. And in every country surveyed – except Russia (where confidence rose 42 percentage points) and Israel (+7 points) – Trump’s ratings are lower than Obama’s at the end of his term. This includes precipitous drops of as many as 83 percentage points in Sweden, 75 points in Germany and 71 points in South Korea. Even in Kenya and Ghana, where about half have confidence in Trump, his ratings are significantly lower than those of either Obama or Bush. For a complete trend on views of the U.S. president over time, see Appendix A. Although strong majorities across Europe have little to no confidence in President Trump, opinions of Trump have lifted slightly in a handful of countries since he was a presidential candidate. For example, in spring 2016, when Trump had not yet secured the Republican nomination for president and Pew Research Center surveyed publics in Europe, Asia and Canada, only 12% in the UK had confidence in Trump’s international abilities. But in 2017, 22% now have confidence in Trump, a rise of 10 percentage points. A similar jump occurred in the Netherlands (+10), as well as in Canada (+8), Japan (+15) and Australia (+18) outside of Europe. Views of Trump also improved between 2016 and 2017 in Greece (+16), Hungary (+9) and Poland (+8), but those changes might be on account of the large number of people who did not answer the question in 2016. For example, 42% of Poles had no opinion of Trump in 2016 vs. 21% in 2017. In some countries in Europe and the Asia-Pacific, men are more likely than women to say they have confidence in President Trump to handle international affairs. The biggest gender gaps in attitudes toward the new U.S. president are found in Canada, the UK and Japan. Men in Germany, the Netherlands, Poland, Sweden, Australia and South Korea are also more likely than women in those countries to express confidence in Trump. There are also significant ideological differences for confidence in Trump in many of the countries surveyed. 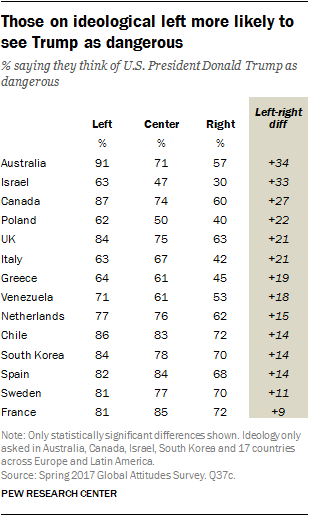 For example, among people on the right in Australia, 51% have confidence in Trump’s ability to handle international affairs, compared with only 8% among Australians on the left. There are also stark divides on confidence in Trump among people of different races, ethnicities and religious affiliations in a few countries surveyed. In Lebanon, for example, a third of Christians say they have confidence in Trump’s international leadership abilities, compared with only 12% among Sunni Muslims and 0% among Lebanese Shia. A similar pattern holds in Israel, where 64% of Jews have confidence in his ability to lead, compared with only a quarter of Arabs. And in Nigeria, seven-in-ten Christians have confidence in Trump compared with less than half (46%) among Nigerian Muslims. Trump also gets greater confidence from supporters of populist parties on the ideological right in Europe. For example, among people in France who have a favorable view of Marine Le Pen’s National Front, 39% have confidence in Trump, compared with only 6% confidence among those with an unfavorable view of the right-wing party. Similar divides exist among United Kingdom Independence Party (UKIP) supporters and detractors in the UK; Lega Nord in Italy; PVV (Geert Wilders’ Party for Freedom) in the Netherlands; Sweden Democrats; and the Alternative for Germany Party (AfD). However, even among these right-wing party supporters, among no group is there majority confidence in Trump. As a candidate and newly elected president, Donald Trump has either taken or promised action on a number of important policy fronts with international ramifications. Generally, publics around the world disapprove of the policy directions that Trump has embraced. Trump’s proposal to erect a wall along the border between Mexico and the U.S. generates the greatest opposition in the countries surveyed. Globally, a median of 76% disapprove of building the wall, while only 16% approve. Publics in Europe and Latin America are the most negative, with a median of about 85% in both regions voicing disapproval. In Mexico, 94% oppose building a wall on their border. The idea of building a wall between the U.S. and Mexico receives the greatest support among Jordanians (44% approve) and Israelis (42%), but even in these countries, public opinion is split on the issue. In North America and Europe, men are more likely than women to support building a physical wall between the U.S. and Mexico. Australia has the largest gender gap in approval ratings for the border wall: 26% of men vs. 12% of women support Trump’s announced intention. Prior to the actual decision by the Trump administration to withdraw from the Paris climate accord, a median of roughly seven-in-ten (71%) worldwide said they would disapprove of such a move. In 32 of the 37 countries polled, majorities oppose the U.S. pulling out of climate change agreements. Western European publics object strongly; nine-in-ten or more in Germany (93%), Sweden (93%), the Netherlands (91%), Spain (91%) and France (90%) disapprove of such a step by the U.S. In Africa and the Asia-Pacific region, publics react less harshly to the idea of the U.S. withdrawing from climate agreements. A regional median of 30% in Africa and 25% in the Asia-Pacific region approve of such a move. In his first week in office, President Trump signed an executive order withdrawing the U.S. from the Trans-Pacific Partnership free-trade agreement (TPP), following through on part of his promise to remove the U.S. from several international trade agreements. Majorities in 32 of the 37 countries polled oppose America’s withdrawal from such agreements. Globally, a median of 72% disapprove of Trump’s proposal to withdraw the U.S. from international trade pacts. Roughly eight-in-ten in Canada (78%) and Mexico (80%) disagree with this policy; both nations are TPP members, and many Canadians and Mexicans see the North American Free Trade Agreement (NAFTA) as a good thing for their country. Other TPP member countries feel similarly about the U.S. backing away from trade agreements, with roughly a quarter or fewer in Vietnam (26%), Peru (21%), Australia (19%), Japan (16%) and Chile (11%) supporting this policy. As is the case for many of his other policies, Trump’s proposal to withdraw the U.S. from trade agreements is met with the strongest opposition in Europe (median of 77%). Majorities in only three of the 37 countries surveyed approve of moves by President Trump to restrict immigration from some Muslim-majority countries. Globally, a median of 62% reject this policy stance – nearly twice the percentage that support it. About one-third support the travel ban in Europe (a median of 36%), Africa (35%), Latin America (32%) and Asia (31%). Majorities in Hungary (70%) and Poland (56%) back tightening restrictions on people entering the U.S. from some Muslim-majority countries. More than four-in-ten in Vietnam (47%), Australia (45%), Greece (45%) and Italy (44%) also approve of the proposal. A majority of Israelis (63%) and more than half of Russians (53%) also support this policy. In comparison, these policies receive extreme disapproval in Jordan (96%) and Lebanon (88%), both Muslim-majority countries with large refugee populations. Similarly, a strong majority in Senegal (82%) – where more than 90% of the population is Muslim – also disagrees with Trump’s policy to tighten restrictions on people entering the U.S. from some Muslim-majority countries. Religious and ethnic divides on the proposed ban also emerge in some countries. For example, Muslims in Nigeria and Lebanon are much more likely to disapprove of the Muslim ban than are Christians in each country. And in Israel, views of this policy diverge strongly along ethnic lines. Among Israeli Jews, 76% approve of the proposed ban, compared with only 12% of Israeli Arabs. In many countries, those on the right of the political spectrum are more likely to approve of Trump’s intention to restrict entry from Muslim-majority countries than those in the center or on the left. In Israel, this ideological divide is especially large: 83% of those on the right approve of this policy, compared with only 21% of those on the left – a 62-percentage-point difference. Australians show the second-largest ideological gap: 64% of those on the right but only 15% of those on the left approve of the travel ban, for a 49-point ideological gap. As a candidate, Donald Trump publicly indicated his intention to withdraw support from the Joint Comprehensive Plan of Action, informally known as the Iran nuclear deal. Globally, a median of only 34% approve of such an initiative, while 49% disapprove. Nations in the Middle East voice more support than other regions: A median of 42% across the region favor the U.S. backing out of the Iran deal. The public in Israel (67%), where Prime Minister Benjamin Netanyahu and other government officials have opposed the deal from the onset, displays the strongest support for the U.S. abandoning the current agreement with Iran. A majority of Jordanians (59%) also approves. In Russia, one of the nations involved in the negotiations for the Iran agreement, the public is split on this issue: 38% approve of the U.S. withdrawing support for the deal while another 38% disapprove. Opposition is high, though, in the other countries involved in negotiations. Majorities in the UK (58%), France (62%) and Germany (71%) do not want the U.S. to back out of the deal. Survey respondents were read a list of four positive and three negative characteristics, and were asked whether each was something that described President Trump. Among the positive characteristics tested, Trump gets his highest marks for being a strong leader. Half or more in 23 of the countries surveyed say this about him. Across 37 countries, a median of 55% describe him as strong. Even in places where confidence in Trump is low, such as in Latin America and parts of Europe, majorities say that Trump displays strong leadership. Across the other three positive characteristics tested, Trump fares less well. When asked whether Trump is charismatic, in only 10 nations do half or more say this describes the U.S. president, with a global median of 39% holding this view. Trump gets his highest marks for charisma in places where people have confidence in him, such as Israel (71%), Vietnam (68%) and Russia (62%). But he also gets relatively high marks on charisma in places with lower confidence in him, such as Hungary (58%), Poland (53%) and France (52%) in Europe and South Korea (62%) and Japan (54%) in Asia. In 14 countries, men are more likely than women to see Trump as charismatic. For example, in Sweden, 51% of men see Trump as charismatic compared with only 32% among Swedish women. On whether Trump is well-qualified to be president of the U.S., most publics say that he is not. A median of only 26% see Trump as qualified. The strongest support for Trump’s qualifications comes from Vietnam, the Philippines, Russia, Ghana and Nigeria. Across Europe, the Middle East and Latin America, as well as most of Asia, few see Trump as well-qualified, including only 6% of Germans, 11% of Mexicans and 15% of Japanese. In 12 nations, men are more likely than women to see Trump as well-qualified. For example, 29% of men in Australia say that Trump is qualified, compared with only 16% of Australian women. Trump based much of his presidential campaign on connecting with “ordinary” Americans, but when asked whether they think Trump cares about ordinary people, a global median of only 23% say that he does. Across all the characteristics tested, positive and negative, President Trump is most likely to be described as arrogant. Across the 37 nations, a median of 75% say this. Half or more in 29 of these countries consider Trump arrogant, with this sentiment especially common in Europe, Latin America, the Middle East and parts of Asia. This includes 94% in Spain, 93% in Canada, 92% in Jordan and 91% in Mexico. Many also describe Trump as intolerant, with a global median of 65% expressing this view. In 28 countries, half or more say that Trump is intolerant. Once again, the countries most likely to describe Trump in this way are in Europe and Latin America, but also many in the Middle East and Asia share this view. When asked whether they think of Trump as dangerous or not, a median of 62% across the world say that he is. In 26 nations, half or more consider him a danger. These fears are most evident in Mexico (83%), but also acute across most of Europe and Latin America. In contrast, only around a third or less of Russians, Nigerians, Ghanaians and Indians describe Trump as dangerous. Ideology is often linked to whether publics see Trump as dangerous. In many of the European countries, as well as Australia, South Korea, Israel and Canada, those who place themselves on the left of the ideological spectrum are more likely to say that Trump is dangerous compared with those on the right. For example, 63% of those on the left in Israel say Trump is dangerous, compared with only 30% on the right. In a few additional countries, such as Peru and Brazil, it is actually those in the center ideologically who are most concerned about Trump as a danger. Despite widespread opposition to many of the Trump administration’s key policies and a lack of confidence in the new U.S. leader, many around the world believe their country’s relationship with the U.S. will not change much over the next few years. Across the nations surveyed, a median of 41% say they expect their country’s relations with the U.S. will stay about the same. A median of only 15% expect the relationship to improve over the next few years, while roughly twice as many (32%) believe U.S. relations with their country will worsen. Among the most optimistic are publics in Africa, where a median of 27% expect relations between their country and the U.S. to improve in the coming years. Nigeria (54%) and Ghana (51%) have especially high levels of optimism. Russians (53%) have similarly positive expectations for the future of U.S.-Russia relations. Only 10% believe the relationship will deteriorate under President Trump. In the Middle East and North Africa, three times as many people say their relationship with the U.S. will worsen (33%) as say it will improve (11%). Israel is an outlier in the region, with 65% of Israelis saying they anticipate a better relationship with the U.S. now that Trump is president. By contrast, Mexicans are the most pessimistic about their relationship with their neighbor to the north. Two-thirds in Mexico expect relations with the U.S. to worsen under Trump. About half that number (a median of 32%) share that view across the seven Latin American nations surveyed. Europeans are the most likely to think that their relationship with the U.S. will not change over the next few years; roughly half (51%) across 10 European countries assert this view. Yet, a majority in Germany (56%) and almost half in Sweden (48%) are pessimistic about future U.S. relations.